ARLINGTON, TX - JANUARY 20, 2015 - Arlington Mayor Robert N. Cluck, Dallas Mayor Mike Rawlings, the City of Arlington, the City of Dallas, The Dallas Cowboys, the Stadium Events Organizing Committee and WWE® are proud to announce that AT&T Stadium will host WWE's pop-culture extravaganza, WrestleMania 32, on Sunday April 3, 2016. The historic announcement was made at a press conference held at AT&T Stadium. Mayor Cluck, Dallas Cowboys Executive Vice President and Chief Brand Officer Charlotte Jones Anderson and three-time Dallas Cowboys All-Pro Ed "Too Tall" Jones joined WWE Chairman & CEO Vince McMahon, WWE Chief Brand Officer Stephanie McMahon and WWE Executive Vice President of Special Events John P. Saboor in making the announcement. WWE Hall of Famer Hulk HoganTM, WWE Superstars John Cena®, Big Show®, Mark Henry®, WWE Divas Brie BellaTM, Nikki BellaTM, NatalyaTM and Alicia FoxTM also made special guest appearances at the event. "On behalf of the city of Arlington, we thank WWE for choosing AT&T Stadium to host their biggest event of 2016," said Arlington Mayor Robert N. Cluck, M.D. "We look forward to fans from around the world converging on our beautiful city for WrestleMania Week." "The city of Dallas is proud to team with Arlington to bring WrestleMania 32 to AT&T Stadium," said Dallas Mayor Mike Rawlings. "The week-long series of events will provide an economic boost to our region, while giving visitors a chance to experience all the great things Dallas has to offer." "On behalf of the entire Dallas Cowboys organization, we're excited to welcome WrestleMania 32 and fans from around the globe to AT&T Stadium," said Charlotte Jones Anderson, Executive Vice President and Chief Brand Officer of the Dallas Cowboys. "An iconic entertainment extravaganza like WrestleMania and its fans deserve a world-class venue like AT&T Stadium that will redefine the WrestleMania experience and set a new precedent for future events." 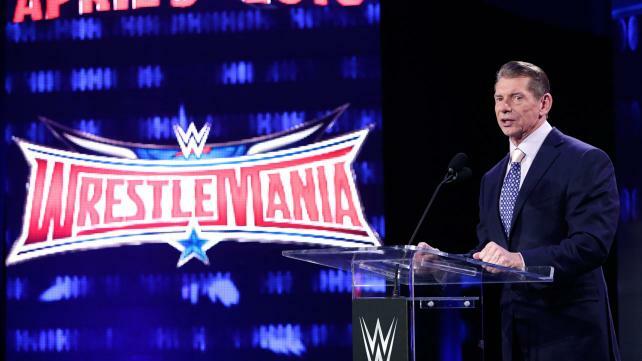 "WWE thanks the city of Arlington, city of Dallas and the Dallas Cowboys for their tireless efforts to bring WrestleMania to AT&T Stadium," said Vince McMahon, WWE Chairman & CEO. "We look forward to making history at WrestleMania, while adding AT&T Stadium to the list of iconic venues that have hosted our annual pop-culture extravaganza." WrestleMania is more than just a one-day event; it's a week-long celebration that will stretch throughout the Dallas/Arlington region. In addition to WrestleMania 32, other activities will include: WrestleMania Axxess - WWE's four-day interactive fan festival at the Kay Bailey Hutchison Convention Center Dallas; the 2016 WWE Hall of Fame Induction Ceremony at American Airlines Center; Monday Night Raw® at American Airlines Center; Be a STARTManti-bullying rallies; hospital visits and other community outreach initiatives designed to give back to the host community. The event will be broadcast live on WWE Network and pay-per-view in more than 170 countries. Last year, WrestleMania 30 at Mercedes-Benz Superdome generated more than $142 million in economic impact for the New Orleans region. This year, WrestleMania 31 takes place Sunday, March 29 at Levi's Stadium in Santa Clara, CA.